Not gonna lie, I’m pretty proud of this recipe! 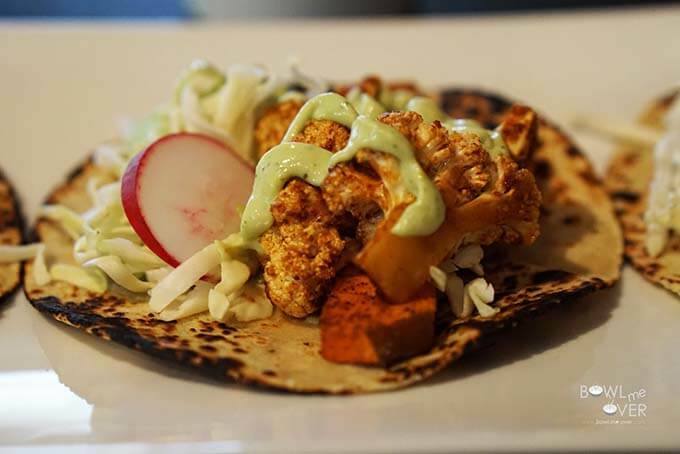 😀 Cauliflower and sweet potatoes in a taco seriously works and the sauce…..greek yogurt, lime and avocado – the word YUM doesn’t quite cut it! I traveled with my hubby a couple weeks ago and while he was busy at work, I explored the San Ramon area and ran across Baagan a lovely vegan restaurant where I had lunch. Lunch was…you guessed it – Roasted Chipotle Seasonal Tacos, well I was so impressed with that meal I came home and put my “Deb” twist on it. 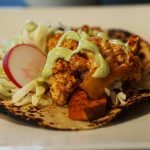 I think I nailed it, the tacos are spicy (but not too), meaty with the roasted vegetables – my avo-lime sauce is not vegan (Baagan served an absolutely delicious vegan version), but I love the twang you get from greek yogurt and I think you will too! Here’s how I started it off. I roasted cauliflower and sweet potatoes. The cauliflower I left in large florets and sweet potatoes I cut into large planks. 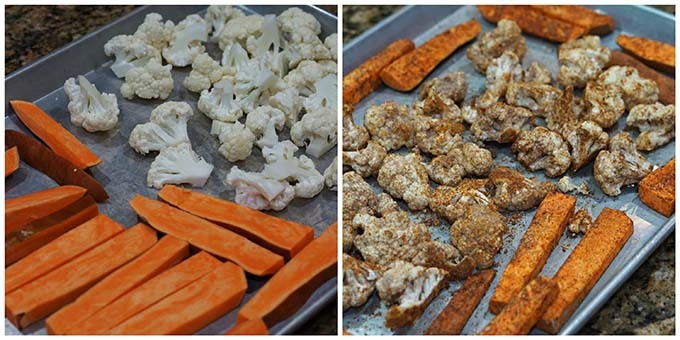 I tossed all of this in ziplock bag with some spices and spread them out on a large sheet pan, being careful to space them apart – I wanted them to roast, not steam. Also, here’s a great tip – I placed the sweet potatoes around the edges of the pan. The edges get hotter than the middle and they will roast more quickly that way. While the vegetables were roasting, I made the Avo-Lime Sauce. Using my blender, I added greek yogurt, lime and an avocado – then some spices & pickled jalepenos slices for a bit of punch and whirled it up – done! 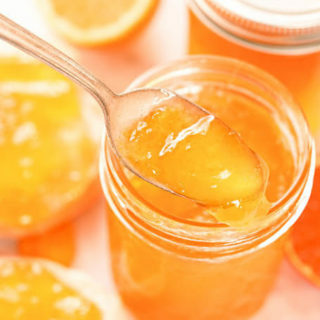 It is tangy, creamy and just a bit spicy! Next I grilled off the tortillas right over an open flame on the stove. 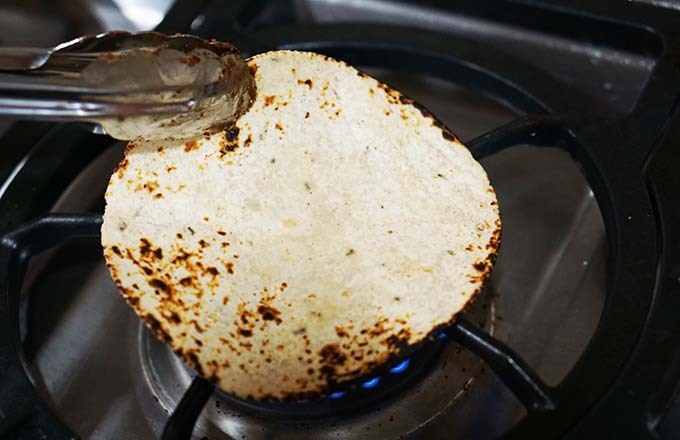 I love how the tortillas gets that roasted edge and taste – the tortillas can also be warmed up in the oven, I just love the taste you get straight from the flame, if you have a gas stove, give that a try! The vegetables only take 14 minutes to roast in a hot oven too, so this is a great 30 Minute Meal – perfect for a busy weeknight meal! These tacos are meaty, crunchy, spicy and we loved them! I made them three times last week, yes partially to “nail” the recipe, but also because they are that good! 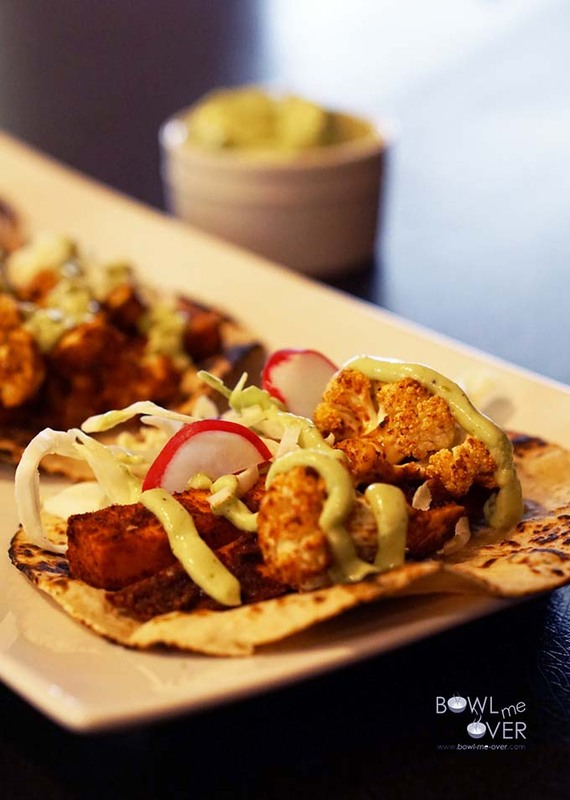 If you’re on the fence about vegetarian or vegan food, definitely give these a try – and if you’re ever in San Ramon or their second location in Rocklin, CA – visit Baagan! 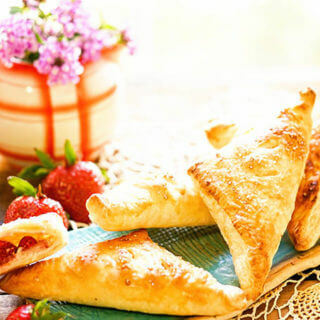 Delicious food, artfully presented, so good – I know you’ll love it! 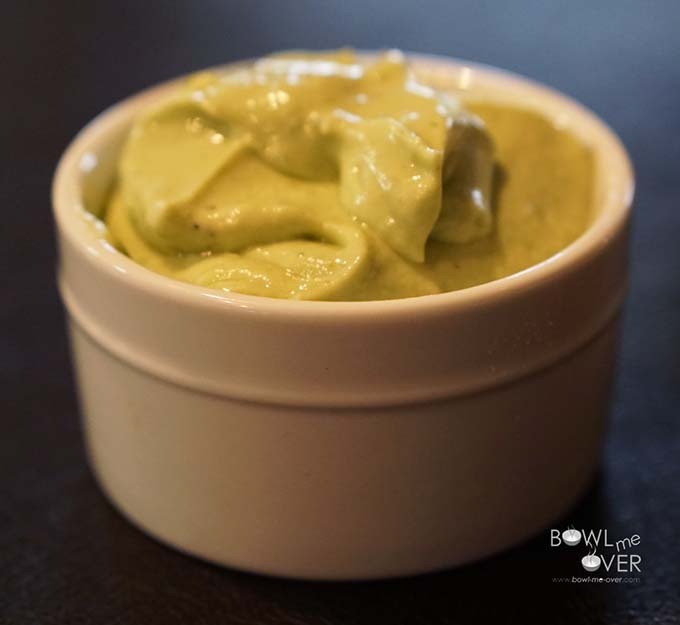 Creamy avocado sauce with lime for an extra tang! This sauce ads tons of healthy flavor!! 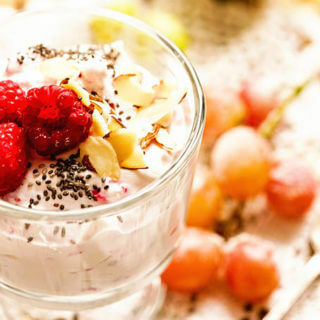 Place all of the remaining ingredients in the blender except the water and pulse to puree. Add as much water as needed to reach a creamy spreadable consistency. Refrigerate leftovers (that is if you have any!) 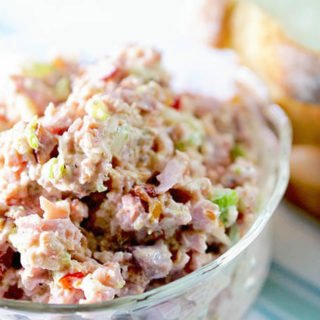 Leftover will last 3 days in the fridge - you can also make this ahead. 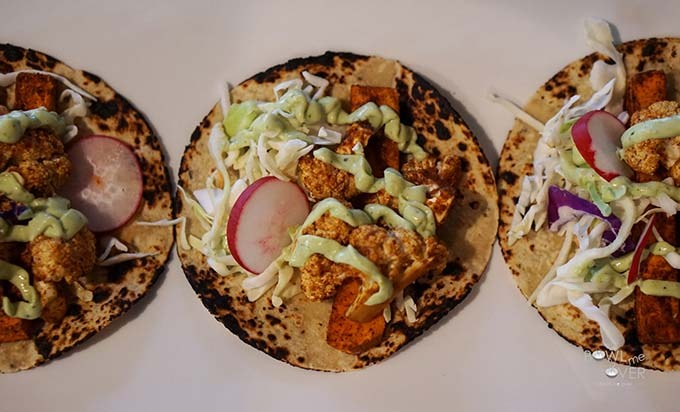 Crunchy vegetarian tacos that are easy to make and so tasty too! vegetables for topping as desired - cabbage, radishes, lettuce, etc. Add the paprika, salt, cumin, chipotle chili powder and cornstarch to a large ziplock bag, mix well - set aside. Cut the cauliflower in half, saving ½ for future use. Separate the florets, try to keep them large. Scrub the sweet potato well - no need to remove the peel. Slice the sweet potatoes in ½ "planks". Spray the vegetables with nonstick spray (also spray the pan you are going to put them on) and place them in the ziplock bag. Mix well to thoroughly coat the vegetables. Spread them out on a large cookie sheet - keep the sweet potatoes around the edge. Roast for 14 minutes flipping once during cooking. The vegetablse will still be quite crisp. Build your taco, top with desired toppings, Avo-Lime sauce and serve! This meal looks great. We will have to try it soon. We’ll give it a try when you visit next, that would be fun! Wow. That looks really delicious. Thank you Sheri, so good to hear from you!! It looks amazing. Can’ wait to try it. 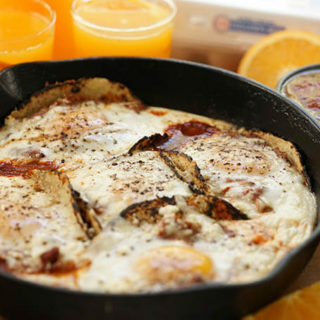 Yum, yum – you’ll love this one! Used your cumin & chipotle powder in this delicious meal, thank you! Oh I love the recipe you recreated from a meal in a restaurant. This is totally my kind of dish (I love veggies) and it’s such a shame I already had dinner, otherwise I would have loved to make them. I keep the recipe for later! Awesome Del – I hope you give it a try, I’d love to hear what you think! Really creative. I like that you used the cauliflower and sweet potatoes but the avocado lime sauce is wonderful. Thank you Peter, we really enjoyed this meal! I am loving this recipe. It’s unique and looks delicious! Thanks Suzy I really appreciate it! I’ve become quite enthralled with roasted vegetables lately and I can’t recall seeing a more alluring recipe for using them! 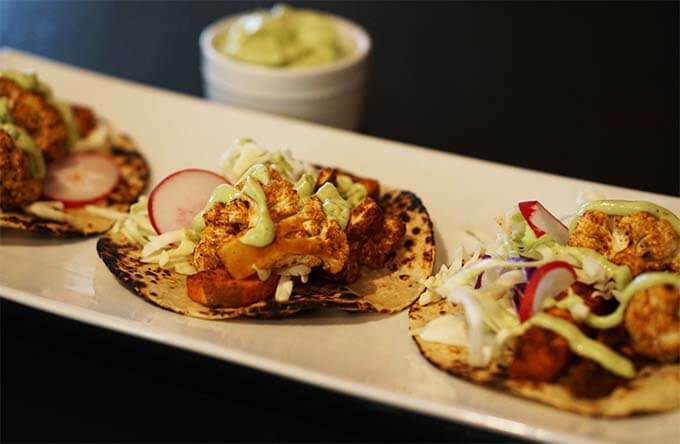 These tacos look very authentic and equally delicious! Yes toasting the tortillas gives them that “restaurant” flavor, YUM! Thanks Adriana!! Love that sauce! What a fantastic idea! Thanks Rebecca, we did too – I hope you give it a try! This meatless taco is calling my name. I’ll have to try out the avo-lime sauce soon. It looks wonderful. Thanks Michelle! 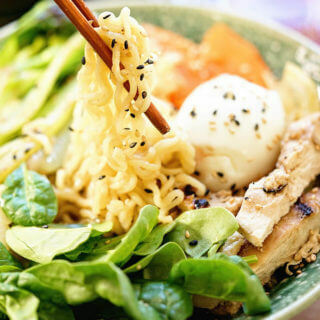 You’ll love that avo-lime sauce, so yummy!! Those tacos sound amazing. 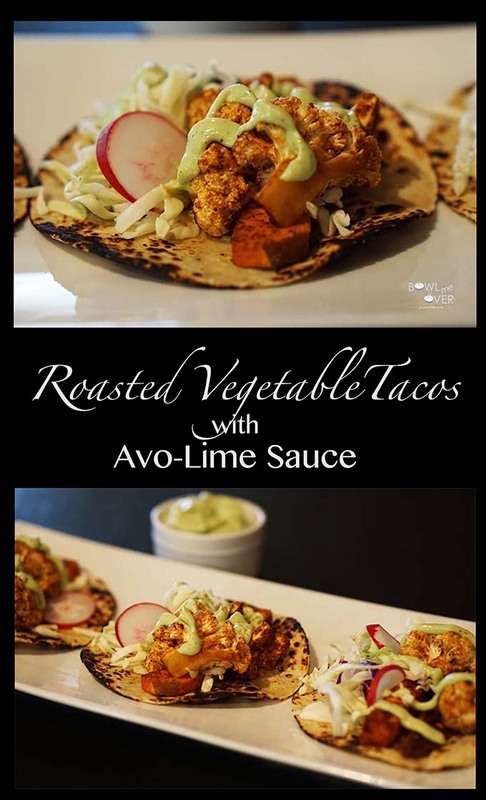 I have used sweet potatoes with chicken in tacos, but I love the idea of using all veggies. Your sauce makes the recipes. I would be sneaking spoonfuls straight from the bowl! Yup, but rather than using a spoon, I used a chip – spoon would have saved me some calories, LOL! Thanks for stopping by Kristen! 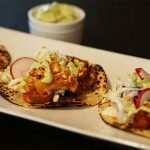 Awesome Crisy – I hope you give these yummy tacos a try! !